The following is a news release from NASA Earth Observatory. Two weeks after a new record was set in the Arctic Ocean for the least amount of sea ice coverage in the satellite record, the ice surrounding Antarctica reached its annual winter maximum—and set a record for a new high. Sea ice extended over 19.44 million square kilometers (7.51 million square miles) in 2012, according to the National Snow and Ice Data Center (NSIDC). The previous record of 19.39 million kilometers (7.49 million square miles) was set in 2006. The map above shows sea ice extent around Antarctica on September 26, 2012, when ice covered more of the Southern Ocean than at any other time in the satellite record. The map is based on an NSIDC analysis of data from the Special Sensor Microwave/Imagers flown in the Defense Meteorological Satellite Program. Land is dark gray, and ice shelves—which are attached to land-based glaciers but floating on the ocean—are light gray. The yellow outline shows the median sea ice extent in September from 1979 to 2000. Sea ice extent is defined as the total area in which the ice concentration is at least 15 percent. The graph of NSIDC data shows the maximum extent for each September since 1979 in millions of square kilometers. There is a lot of variability from year to year, though the overall trend shows growth of about 0.9 percent per decade. 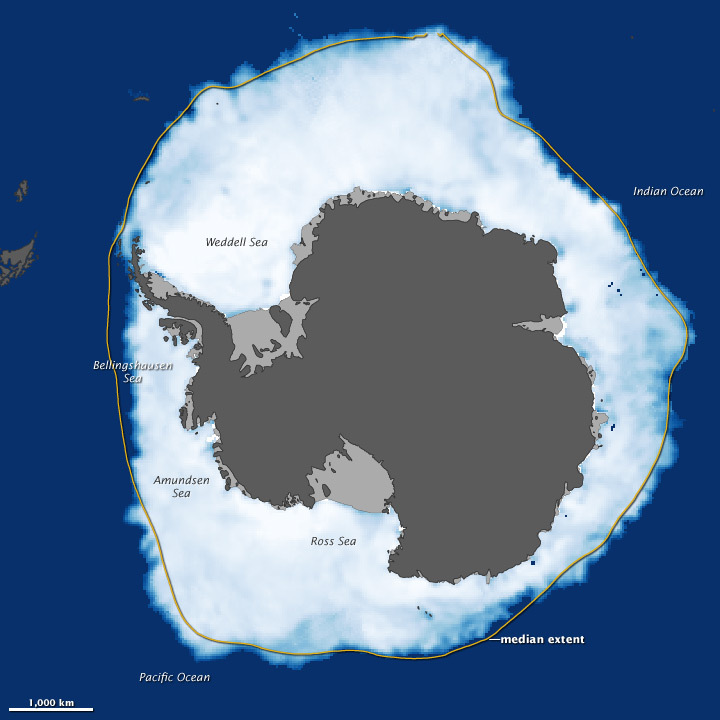 According to a recent study by sea ice scientists Claire Parkinson and Donald Cavalieri of NASA's Goddard Space Flight Center, Antarctic sea ice increased by roughly 17,100 square kilometers per year from 1979 to 2010. Much of the increase, they note, occurred in the Ross Sea, with smaller increases in Weddell Sea and Indian Ocean. At the same time, the Bellinghausen and Amundsen Seas have lost ice. "The strong pattern of decreasing ice coverage in the Bellingshausen/Amundsen Seas region and increasing ice coverage in the Ross Sea region is suggestive of changes in atmospheric circulation," they noted. "The year 2012 continues a long-term contrast between the two hemispheres, with decreasing sea ice coverage in the Arctic and increasing sea ice coverage in the Antarctic," Parkinson added. "Both hemispheres have considerable inter-annual variability, so that in either hemisphere, next year could have either more or less sea ice than this year. Still, the long-term trends are clear, but not equal: the magnitude of the ice losses in the Arctic considerably exceed the magnitude of the ice gains in the Antarctic." On their Arctic Sea Ice News and Analysis blog, scientists from the University of Colorado wrote: "Comparing winter and summer sea ice trends for the two poles is problematic since different processes are in effect. During summer, surface melt and ice-albedo feedbacks are in effect; winter processes include snowfall on the sea ice, and wind. Small changes in winter extent may be a more mixed signal than the loss of summer sea ice extent. An expansion of winter Antarctic ice could be due to cooling, winds, or snowfall, whereas Arctic summer sea ice decline is more closely linked to decadal climate warming."